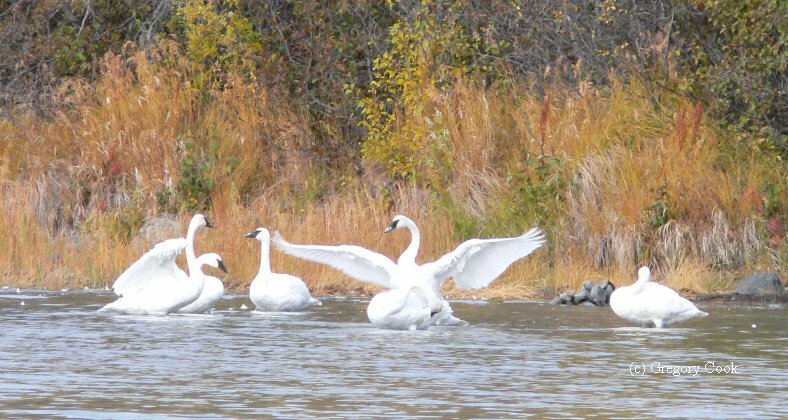 My Swan Story - by Richard R.
I'm an old-school retired Alaska Department of Fish & Game fisheries biologist and I've lived here in the Bristol Bay, Alaska area for almost 50 years. Those Trumpeter Swans that over-winter here don't appear to guide their cygnets out of the local area...we see them here in the fall, winter, and in small cohort groups after the adults abandon them the next April-May period. About the only way I can lean towards identifying individual family cohorts during the late summer through about mid April is by how many cygnets they are shepherding around. After mid-April they abandon these new sub-adults and go off to raise a new set...and the somewhat lost acting young birds seem to group up together and swim around feeding and exploring together until they also disappear from our local river as boat traffic increases and summer vegetation begins to obscure local viewing opportunities. I hardly ever see them here between mid-June & mid-September...so they are probably scouting future partners and future nesting sites during that time...while their parents are bringing off a new clutch of young. My Swan Story - Ann N.
My husband and I moved to our lake home here in Minnesota almost 4 years ago. The natural beauty of lake country has been a tremendous gift to all our family. Many times as I have looked out over the pine-rimmed lake at sunset, I have humbly realized that somehow we have managed to secure our own piece of heaven here on Earth. And the wildlife who are the original citizens of the wooded hills and lakes all around us, have amused and befriended us through the seasons. The deer appear often moving silently through the trees, sometimes pausing to watch as we walk the road through the woods. Groups of wild turkeys saunter across the landscape occasionally. And bald eagles glide above the treetops, scanning the shallows of the lake for fish, or riding on the breezes above the shimmering waters. All of the creatures here catch my attention, but it is the Trumpeter Swans that have completely captured my heart! It is quite striking to me that such a very large powerful bird can demonstrate such fluid grace and mystical beauty. I remember hearing in years past worrisome reports that these amazing birds had reached very low numbers. So it was exciting indeed when we realized that the beautiful snowy white swans that we were seeing on the ponds and sloughs near our new home were Trumpeter Swans. Thankfully, the Trumpeter Swans are here much of the year. There is a family of swans that we have been watching since we moved to the area; we almost feel that they are our neighbors! We have been watching them nesting each summer on a large slough about a mile down the road from our home. The swans must not mind the slow movement of the occasional cars passing by, as they have returned to nest there each summer since we have lived here. We have enjoyed very much that as we leave to go to work or run errands, that we can often see the swans resting out on the water or preening themselves on the shoreline. We can see their nest on the shore, and when eggs are apparently laid, the adults become very faithful indeed and are sitting on that nest almost constantly. We have watched impatiently during the nesting period, and then are finally rewarded in later summer to witness the little cygnets out on the water with their proud parents. This lovely family has truly been a delight to watch!! It is now almost December and the cold weather is upon us here in Minnesota. The slough down the road froze over a few weeks ago, while the larger lake by our home still remained open. About the time that the slough froze hard, we started to see 2 adult swans with 2 good sized cygnets down at the shoreline in front of our home. We were excited to see them up so close! We watched them closely on several occasions with our sighting scope, and referred to identification information online to determine specifically what kind of swans they were. We were quickly able to positively ID the swans as Trumpeters, which we had already suspected. We have had pretty cold weather recently, and our lake is now frozen over as well. The deep cold of winter is taking a firmer grip on the wooded hills, encasing the waters in crystalline sheets of ice. So our lovely swans have moved on. We have noticed that there is a river that passes through the nearby town of Park Rapids that does not completely freeze over each winter. I have been told that the area stays open because there is a spring feeding the river, preventing freeze in the close vicinity. And in the brisk cold of winter, we have seen numerous geese and swans that seem to be fine with wintering in that rather crowded and limited area of open water. So we will be watching again this winter, hoping to see some of our swans in that popular little bay. These amazingly lovely birds are a blessing to so many all through the year!! 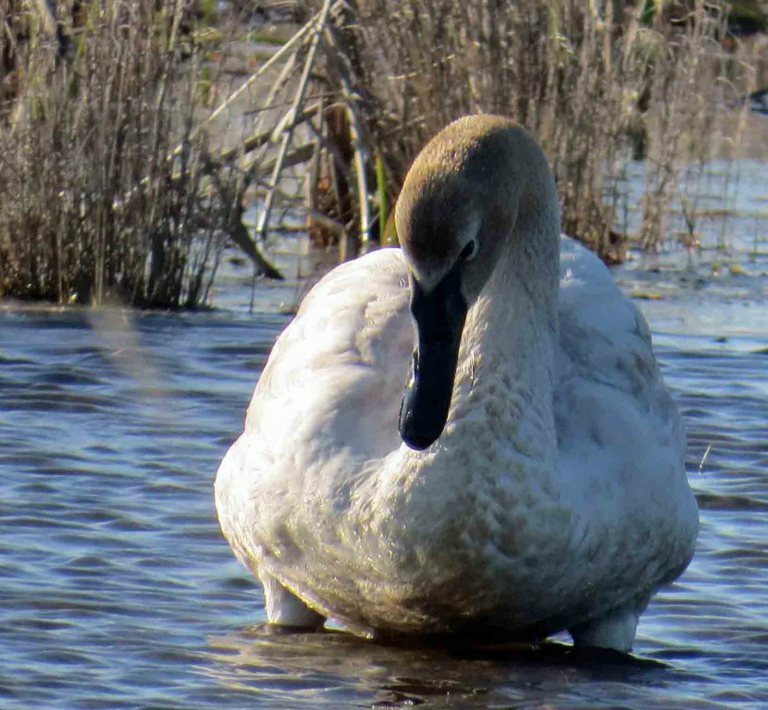 The return of sizable numbers of Trumpeter Swans in recent years to Minnesota and indeed to the larger United States, has portrayed the successful rescue of a true treasure among our local wildlife. 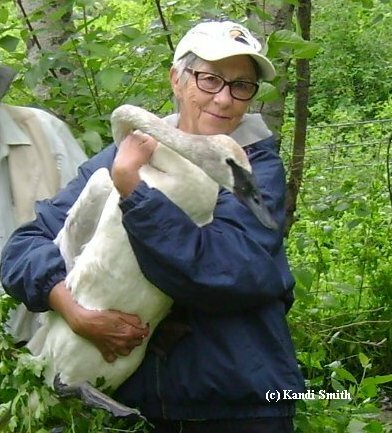 We offer our sincere thanks for the important work of The Trumpeter Swan Society in helping monitor and support the welfare of these beautiful birds! My Swan Story - by Rick M.
On a Christmas afternoon some years ago, six Salt Lake City friends decided, on the spur of the moment, to drive up to Jackson Hole for an impromptu cross-country ski tour. The next morning, after a hearty breakfast, we geared up and headed to the Oxbow Bend area. The temperature was minus 23 F, but we were prepared for it. As so often happens when it gets that cold in Grand Teton, most of the landscape was shrouded in a dense layer of fog, but we could discern blue skies above. As the fog began to lift, the Tetons—those most perfect mountains that we were all anticipating the first sight of—began to reveal themselves to the west; Oh, glorious day! But the fog still lay heavy along the Snake River. The air was perfectly calm, the only sound coming from our every step and glide on the hoar-frosted snow. Timing is everything… We were just getting used to the cold when the first sun began to shine through the fog. The scene was so stunning we all seemed to stop in our tracks at once… just in time to hear the faint trumpeting of swans coming our way… getting louder. As we stood listening, waiting, hoping, eight adult trumpeter swans rose through the breaking mists into the sunlight, flying low over the river, right in front of us, seemingly unaware of our presence. Besides their trumpeting, the only sound was the beat of their wings. Eight grand symbols of all that is pure and perfect, rising into daylight in a perfect place. It was so beautiful it made me weep. And when I looked to my friends, every one of their reactions was the same. We just smiled silently at one another, grateful to share such a moment… an extra special little Christmas gift. Cygnets die from natural causes such as injuries, chronic health problems, and predator attacks. I have witnessed from my Arctic Tern airplane bald eagles hovering overhead and making steep dives to attack newly hatched cygnets with their sharp claws. The eagles were not successful as the cygnets were close to their parents for protection or even went under their feathers and disappeared. After several rushing attacks by the coyote and about 5 minutes later, the coyote gave up as it was clear the male swan was too much for the coyote to reach the cygnets. The pair of coyotes trotted away from the pond disappointed. I watched the whole event while circling at an elevation in my airplane high enough above the animals that they would not have noticed my presence. It was like being in a front-row seat watching a sporting event. My Swan Story - by Marilyn A. About four years ago, I was going through a very difficult time. There is a very lovely cemetery where my grandmother and aunts and uncles are buried. I had not been to the cemetery in a number of years but the need to go there was great. I went to the grave sites and then got into my car to leave. At the other end of the cemetery is a pond and I suddenly was drawn to go there. I drove to the pond. I parked my car and sat on a bench, alternately watching two beautiful trumpeter swans in the water and crying. I was sitting near the swans' feeding station and they came out of the water to eat. I sat quietly and watched. When the first swan was finished eating, she started over in my direction and came close to me, first on one side of the bench and then the other. I could've reached out and touched her. She was so close, but I was afraid because I didn't know how she would react. For me, it was a spiritual encounter. I felt so incredibly blessed that I had this encounter with the swan. The swans gave me hope for the future and a sense of peace. I did not feel it was a random encounter. In fact, it took many months of weekly visits for the swan to come close to me again. My Swan Story - by Carey S.
I used to spend some time every fall gazing over bobbing decoys in the rain and the fog. On an especially foggy day many years ago, my lab Boomer and I were hunting on a small pond near the lower Columbia River. Despite my calling, or maybe because of it, the ducks were not finding their way through the fog. While Boomer and I were sharing my lunch, we heard raucous cacophony ascending upon our blind. I thought we were being approached by a warming up middle school band trumpet section. The first things we could see through the fog were these black catcher’s mitt-sized feet against the white background. These were being used as speed brakes and then as seaplane floats as about a dozen trumpeter swans planed to a stop some twenty yards in front of our blind. Boomer, who unfortunately is often already out in the decoys to meet most waterfowl species, was as awestruck as was I. We sat transfixed, watching them perform their post flight rituals of flapping and fluffing and finally paddled into the mist. This was my first up-close experience with these regal birds and prompted me to join The Trumpeter Swan Society. On evening of May 2, 2018, this cygnet was discovered wrapped in fishing line near the shore by two men along the Hudson shoreline. When my husband and I and our dog arrived to do our nightly walk we saw them and several people standing around the swan, which was still breathing, tho' shallow. It was unable to even hold its head up. We suspected this swan was one we had been watching earlier that was ailing but we had difficulty finding lately. One of the men who brought it to shore and untangled the fishing line had two children, a young daughter and son. The young boy asked me if I knew how old the swan was and I told him it was a young cygnet, perhaps almost a year old since it still had a gray neck. Unknown to me the young girl was writing something on her paper pad while we talked about what to do knowing it could not be left there for scavengers, because in likelihood it has been ill with lead/ other issues, unable to fly for some time. We had been looking for the sick swan each day but did not see it. I noticed a piece of paper lying beside it. I bent down and saw the young girl had written a note for the swan. She wished for the note to be with the swan and had laid it next to it. The note read: “ R.I.P. cute trumpeter swan. 2017-2018. It died because of fishing line! [she drew a crying face emoji at the bottom of the note]. 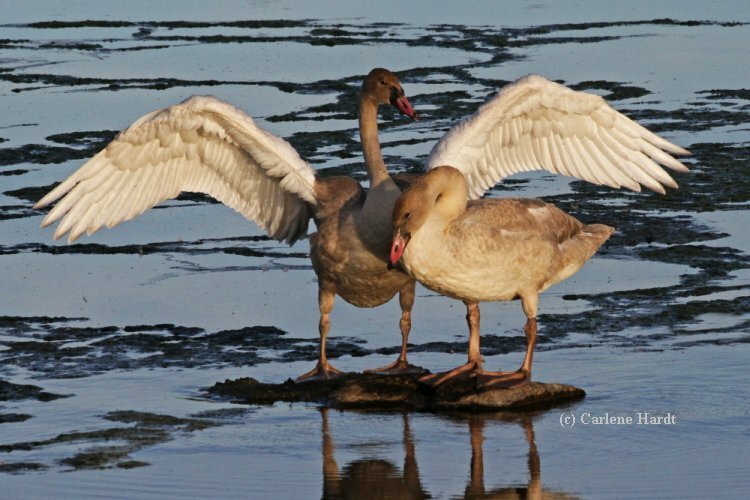 My Swan Story - by Carlene H.
Late September 2018, I was at Turnbull National Wildlife in Cheney, WA and to my delight I came across two cygnets preening on Windmill Pond. I watched and photographed them for over an hour, and they didn’t seem to mind me being there. As I watched them fluff their feathers, stretch their wings, eat, preen and interact with each other, it occurred to me that they were as graceful and as lovely in their own way as the more-familiar white adult swans. One of them was standing on a little rock in the pond when the second one swam over, I wondered if they would take turns, but I was pleasantly surprised to see that they both ended up on the rock. Good thing they were buddies! Once they were out of the water, I could see their feet, which looked like big floppy pieces of thick, wet leather – with claws! When one of them started to stretch its wings, I thought surely there wouldn’t be enough room, but the stretch was successful and this became one of my favorite pictures. My Swan Story - by Cathy K.
I had never seen a swan of any description until twenty years ago. I knew swans lived somewhere but not in my community. In 1999 our local wildlife area had received a lot of printed media coverage about a pair of trumpeter swans being brought to the pond in hopes of increasing the population. I passed the road that leads to the wildlife area everyday but never went in to explore. One day I decided to check it out and drove in. Parking lot was empty, no one around. Rolled my window down and heard for the first time the bugle of the swans. I went back the next day and came across the swan keeper and he showed me around the enclosure and I got a close up look. I swallowed the hook. The pristine beauty and sheer size was unforgettable. I wanted to help. Years went by and life got in the way of me spending any time at the pond but now that I have retired I go back frequently to visit an old swan friend we call Mac (see photo). There is more to Mac's story but I'll make it short. Mac is a twenty year old cob (male) and was located to this pond along with 10 other cygnets in 2000. Harry Lumsden, aka Father Swan, founder of the Ontario Trumpeter Swan restoration project, knew in his experience this pond was an ideal location for these young swans. Mac II became the dominant cob and still resides there today. This year he and his pen have 3 surviving offspring. When I see transient swans gathering on the ice I know that they are the direct result of Harry Lumsden breathing life into the restoration of these magnificent waterfowl. I often think about how close a call it was to losing these special birds. All volunteers and organizations involved with this success story should be very proud to say they had a part in it even if in only one small way. Fly high and live long my friends. 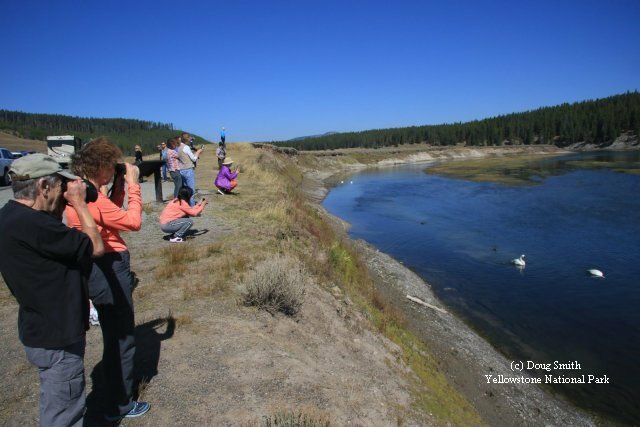 My Swan Story- by Kandi S.
Over the past couple years, my husband and I have had the opportunity and pleasure to participate in the pre-release and banding of cygnets as part of the Flathead restoration project. The boots on the ground team included breeder John Jarvis, tribal biologist Dale Becker, a veterinarian and volunteers on the Salish Kootenai Reservation. To facilitate the capture of these penned cygnets, the team had to physically catch and secure these majestic birds for testing and banding. As the birds began to run and flail, I could totally see quite a rodeo coming. To my surprise, as each was secured in the arms of a volunteer, the birds quieted, accepting the needles, handling and placement of the big red numbered collars calmly. What sticks in my mind is the endearing way in which many of the birds drooped their long necks and heads around their captors’ necks, exhibiting such a gentle, trusting nature. This is where they HAD me! Smoothly and orderly, the ordeal was over and the youngsters were carefully carried to a trailer for transport to a local reservoir. Upon the arrival and doors swinging open, twelve boisterous cygnets exited for their first taste of freedom and real use of their gigantic wings. They briskly marched to the pond, chattering all the way, and eventually bobbed off into the distance. Waiting anxiously on the shore like nervous parents, the surrogate team gave a hoot and a holler in response. It had been a successful and safe release into the wild and was a very good day for man and bird. As an added bonus for us, some of the birds return to a fishing access near the place we walk the dog many mornings. From afar, we can check their numbered collars. Occasionally we get to say hello again to one of those fabulous birds we got up close and personal with one summer day in Montana.